Bellabaci Silicon Cups are great for anti-ageing, headaches, sinus congestion, spider veins, cellulite and painful muscles etc. You can use them at home easily. Combined with the Bellabaci Genies - unique blends of essential oils, virgin coconut oil, homeopathic remedies and flower remedies - the cupping system offers a unique home treatment for your health and beauty concerns. I have these in stock now so check out the links and contact me for more information. My excuse is that chocolate is full of anti-oxidants - and everything in moderation! Chocolate contains protein, fat, calcium, iron, magnesium and anti-oxidants called phenols. In Chinese Medicine dark chocolate is bitter and sweet and goes to the heart meridian. Small quantities of dark chocolate can actually help people with anxiety. Pre-heat the oven to 200 celsius. Grease the ramekins, you will need six and place them on an oven tray. Melt chocolate in a bowl over simmering water. Cool slightly. Cream together the butter and sugar, then add pinch of salt and vanilla extract. Add flour, bit by bit, when smooth scrape in cooled chocolate. Blend together until mixed. Divide batter evenly between ramekins. At this point you can put them in the fridge for an easy dessert without the fuss for your dinner party. It's great to make them in the morning or even the day before. If not pop them straight in the oven for 10 minutes. If they are coming straight from the refrigerator they will need 12 minutes. Tip them onto their serving plates and serve with whipped cream or ice cream. Decorate with berries if you like. Luscious. These desserts need some "swoon" music, try this music by Daniel Hope from his Spheres album and enjoy this decadent molten naughtiness. Bone broth is the uber-trendy drink that is taking the country by storm! It's the drink that everyone from Gwyneth Paltrow to Elle MacPherson is talking about and they are sipping their way to youthfulness - it actually turns back the clock. It is being touted by celebrity nutritionists and the fashion set as the new "green juice". Bone broth is actually one of the oldest healing and anti-aging foods on the planet - it has been used in Chinese Medicine for thousands of years and is always recommended after childbirth. Now it is being touted as the latest anti-aging and weight-loss drink. Current science and hundreds of generations of healers agree on its magical qualities. Collagen. Structural protein to build strong skin, protect against aging and wrinkles. Dietary collagen mainlines directly to your cells. It also reduces inflammation and is beneficial for your digestive tract. A great way for those with inflammatory bowel conditions to ease symptoms. Glycine. Our bodies are bombarded with toxins each and every day that age us. Glycine helps our liver rid these toxins from our bodies, re-energising and de-aging our cells in the process. Minerals. Bone broth is a power-house of minerals and its chemical composition make them bio-available. Glycosaminoglycans, including glucosamine, chondroitin and hyaluronic acid, keep joints young and flexible. Bone broth is better than any pill, serum or potion in the anti-aging game. It costs next to nothing. Think about this: It is the ultimate re-cycling project - how many anti-aging treatments can you make in your own kitchen from stuff you would normally throw away? What do you have to lose? Give it a try - have one cup a day and see the difference in within weeks. If you are trying to lose weight make two days a week "bone broth" days and watch the weight fall off. Plus you will start to look years younger. I have included a recipe plus some links to others. Try roasting the bones in the oven first or make Vietnamese Pho - one of the original bone broth soups. I was in Vietnam about 14 months ago and discovered a great jazz club and the most amazing sax player. Here is the link to Tran Manh Tuan. This musician is amazing - he won a scholarship to the Berkeley College of Music in America. "Men" is a common symptom in Chinese medicine. The Chinese character shows a door and a heart inside it. Thus, it would seem to indicate a heart constricted by a door closing on it. I translate this symptom as "a feeling of oppression of the chest". Men is very difficult to translate and my translation is an attempt to convey the meaning of this symptom: it certainly does not claim to be the "correct" translation of men as most Chinese medicine terms have multiple, simultaneous meanings. Chinese patients will actually use the term men: they might say, for example, "I sleep badly, I have a bitter taste and feel men." In my experience, when a Chinese patients says that it means they are depressed. A feeling of oppression of the chest is purely subjective: there is nothing to be observed or palpated (as there is in feeling of fullness or distension). Some patients would describe it as a "feeling of weight" on the chest. Other patients may use the term "tightness of the chest." Men indicates Phlegm or severe Qi stagnation. Men occurs in the chest or, less frequently, in the epigastrium; it does not occur in the lower abdomen. The term men first appears in chapter 19 of the Su Wen where it is described as a feeling of fullness of the chest with anxiety and blurred vision. Men is rich in meaning and, in my experience, it describes not only a physical sensation in the chest but also a mental-emotional state of anguish associated with it. A feeling of oppression of the chest reflects emotional stress especially to do with sadness, grief, worry, shame and guilt. I find this symptom very common in the patients we see. Chronic anxiety often manifests with the feeling of men in the chest and depression may also be accompanied by this symptom. The presence of men indicates two things: first, that there is Phlegm; secondly, that the Lungs and/or Heart are involved. 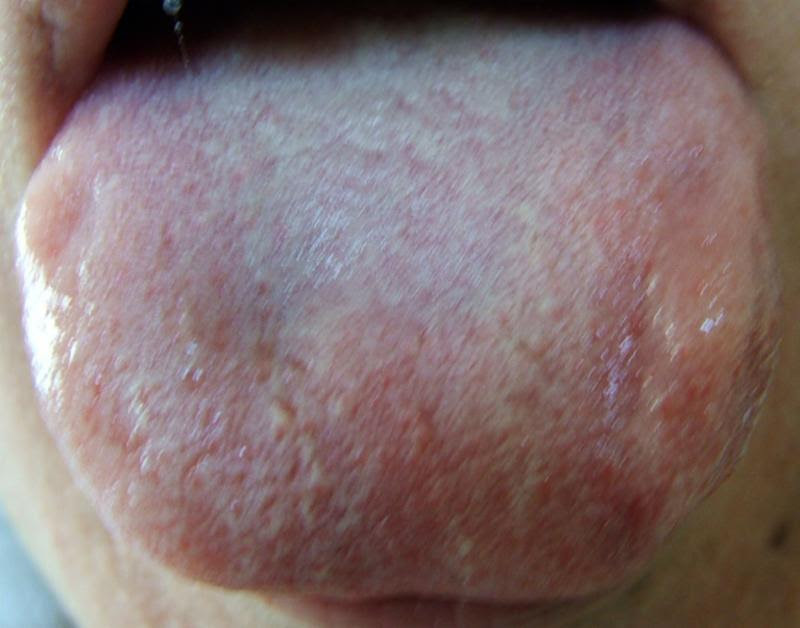 This Phlegm may be of a non-substantial kind and there may not necessarily be any expectoration of mucus (usually there is not). Its main manifestation is precisely the feeling of oppression of the chest and possibly a Swollen tongue and a Slippery pulse.